Twelve months ago, I nearly scrapped my annual spring training pilgrimage to Goodyear. As I wrote at the time, I was underwhelmed by the Reds’ moves during the 2017-18 offseason and questioned the wisdom of spending a dozen hours driving to and from Arizona to see games that didn’t count, especially when the ongoing rebuild had no end in sight. This year, however, I couldn’t wait to return to Arizona to witness the new-look Reds in person. Living in Los Angeles, I’ve seen Yasiel Puig and Matt Kemp play numerous times – I still shudder at the memory of Puig hitting a walk-off home run in extra innings to beat the Reds during his rookie season – but I was still extremely excited at the prospect of seeing the pair dressed in red (and green, as it turned out). Five days before I hit the road, I happened to catch part of a televised game between the Reds and the Diamondbacks, during which recent acquisition Tanner Roark pitched three sharp innings to start the game. It was fun to realize that the next time Roark took the mound, I’d be in the crowd. On the bright side, Roark pitched even better than he did five days earlier, striking out eight and yielding just one hit over five innings. The Reds offense, meanwhile, fared marginally better, and the team clung to a 1-0 lead as the game entered the 8th. The wheels then came off with a vengeance, though, as with one out and a man on first, Reds reliever Anthony Bass walked back-to-back Dodger hitters to load the bases. The next batter singled, and the Dodgers took a 2-1 lead. The following day, I arrived at the Reds’ practice complex bright and early, but their usual 9:30ish start time was delayed by a meet-and-greet with corporate sponsors. As a result, I didn’t get to see much of anything that morning, as gates for that day’s game opened at 11:30 and I wanted to arrive early enough to snag one of 2,000 Eugenio Suarez bobbleheads that were being given away. With bobblehead secured, I “borrowed” an unused front-row seat next to the tarp along the third base line to watch the Reds battle the Rangers. Starter Anthony DeSclafani was nearly as lights-out as Roark was the night before, giving up just two hits over five innings while striking out seven. Considering the state of the rotation in recent years, it was great to see impressive back-to-back starts. My final game this spring saw the Reds take on the Indians, the other team that trains in Goodyear. (Cincinnati was the designated home team for the St. Patrick’s Day matchup, which saw the Reds sporting shamrock green.) 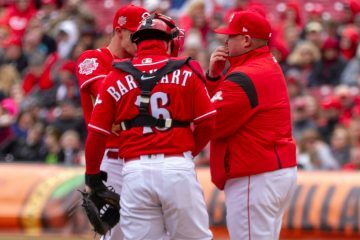 With the exception of Curt Casali getting the nod over Tucker Barnhart (who started the previous day’s game), the starting lineup was loaded, with Scooter Gennett, Joey Votto, Kemp, Suarez, Puig, Senzel and Jose Peraza occupying the first through seventh spots in the batting order. Even with Corey Kluber on the mound for Cleveland, the prospect of a high-scoring game seemed promising. The Reds didn’t disappoint. Although Kluber kept the offense in check his first time through the order, business picked up in the fourth when Votto walked, Kemp singled and Suarez lofted a fly ball that Cleveland CF Leonys Martin appeared to lose in the sun, loading the bases for Puig. One pitch later, the Reds suddenly had four runs on the board. Puig would homer again the following inning, but his defense made it clear that he’ll be a double-edged sword. Early in the game, he and Senzel had a miscommunication that led a ball to drop right between them. Later, after hustling to run down a pop-up to shallow right, he missed the catch in spectacularly embarrassing fashion, an error that led to two unearned runs. Still, the Reds were ahead 9-5 heading into the 9th, when Jesus Reyes came to the mound. He only retired one of the first seven batters he faced, however, and the Indians tied the game. 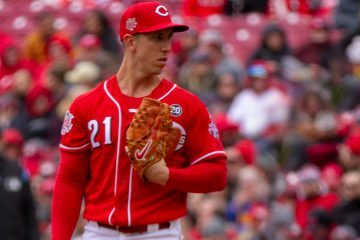 The Reds then went down in order in the bottom half of the inning, and the final score was a 9-9 draw – the third straight time, oddly enough, that a game between the two teams didn’t have a winner. From Goodyear To A Good Year? During the drive back to L.A., I reflected on how different it felt to watch the Reds this spring. Even ignoring the sellout against the Dodgers, Goodyear Ballpark was more crowded than I’ve seen it in recent years. The turnouts at the practice fields were larger than usual as well. Apparently, I’m not the only one who’s optimistic about the team’s new additions and/or chances this year. On that note, it’s one thing to get excited reading about the Reds’ offseason acquisitions on sites like this one. It’s another level of excitement entirely, however, watching those players mow down the two-time defending NL champs and smash grand slams off of two-time Cy Young winners – two emphatic exclamation points that, at least for me, marked the official end of the rebuild. As with my previous trips to Goodyear, getting to see the Reds in action with my own eyes officially marked the end of the long, cold winter and the beginning of a new, as-yet-unwritten chapter filled with what-ifs, why-nots and other similarly tantalizing propositions. 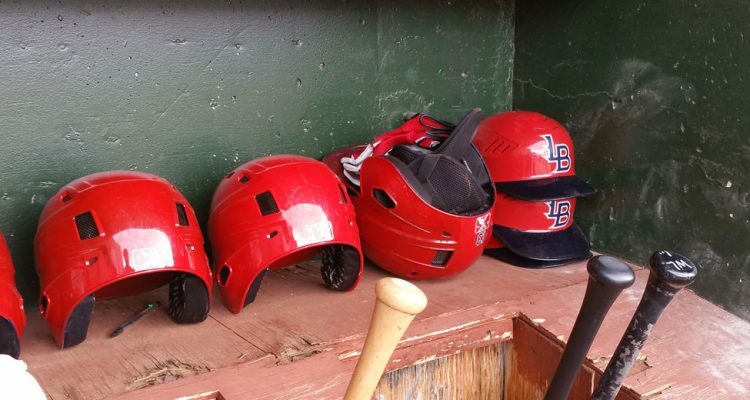 This year, however, those postseason fantasies seem far more realistic than in recent seasons – and to that end, as I left spring training, I found myself thinking not of next March, but of October. Sounds like a great weekend Clay. I’d heard that spring tickets have become noticeably more expensive in recent years. True? And did you buy tickets in advance or only when you got to Goodyear? Thanks for the rundown and the dose of enthusiasm. Only five days until Opening Day! Thanks for reading. I bought my tix in advance for once — Goodyear Ballpark offered a 3-game “mini-plan” that saved me a few bucks on surcharges — but I’m a cheap-seats guy, so I can’t really speak to the cost of tickets overall. The outfield berm seats were still a bargain, though, at $8 for adults, $4 for kids and a Sunday promotion where you got a second ticket for $1. Votto letting a loud “F” bomb as he approached the dugout after his last plate appearance was uncalled for. Many kids around the dugout. Seconds later you could hear another from the dugout. I was on the concourse above the Reds dugout. Low class from the $20+ million man- child. Votto has no class. He disrespects children on a regular basis. He is an embarrassment. Yeah, Ted Williams did that kind of thing all the time, too. Terrible player! I have no idea why the Red Sox kept him. Votto ride past us on the back of a gulf cart as we walked out if ballpark. The other players carried their gear to the waiting bus. Apparently Joey had his own transportation. Peraza seems to be throwing to first with more of an over handed motion. Ball arrives to first straighter. Votto made nice snag of low line drive. Puig throwing home from deep rf corner with runner on third and first was a bone headed play. Runner on third scored, guy on first advanced to second. His throw home was up the line. Even a perfect throw would have been close. Suarez’s base running stupidity has not lessened. He remains clueless on the bases. Stephenson looked good for his two innings. Didn’t have to face yelich or Braun though. Watching David Bell engage a group of kids next to the dugout during warm-ups was nice. I think hiring David Bell was just another Cincinnati nepotism move and mistake. Pat Kelley or Brad Mills would have been a better choice. Bell fits into the third generation/ 150 anniversary theme.